By denialism on March 9, 2017. The American Council on Science and Health recently got some exposure on twitter, then a little too much exposure, after publishing this highly problematic (and hysterically bad) op-ed/infographic on twitter and on their site. Other commentators on Twitter tried to science it up for them by making the y-axis based on pageviews only to learn that oh, that axis was subjective too, based on the author's idea of what compelling is. Come to think of it "Fails to satisfy on any level" is a bit harsh coming from Nature. So basically, no one is fooled here. Scienceblogs is also listed as ideological and of little value, maybe because our sciblings from angrytoxicologist to Effect Measure to the Pump Handle, to me (all the way back in 2007) and the excessively thorough Orac (see also) have been pointing out the obvious for years - the ACSH is astroturf. MotherJones, who admittedly have ideological problems from time to time on GMO and nutrition, are also frequent critics of ACSH, pointing out the felonious past of their one-time Director and their funding from industry for whom they provide excellent cover. The newly revealed documents say that ACSH staffers should approach potential corporate financial backers with pitches geared toward specific issues. Last year, the documents note, the group planned to "seize opportunities to cultivate new funding possibilities (Prop 37, CSC, and corporate caving, etc.)." Proposition 37 was a 2012 California ballot initiative mandating the labeling of genetically modified foods. (It failed.) "CSC" is shorthand for the Campaign for Safe Cosmetics, a consumer watchdog group that seeks to eliminate dangerous chemicals from cosmetic products. The documents suggest ACSH planned to mention CSC in its fundraising pitches to L'Oreal, Avon, and Procter and Gamble. Lately, ACSH has become a vocal player in the debate over hydraulic fracturing, or "fracking." In February, the council posted an outline of a "systematic, objective review" it intends to publish on the scientific literature covering the potential health effects of fracking. In an April op-ed for the conservative Daily Caller website, Whelan criticized Gov. Andrew Cuomo (D-N.Y.) for dithering on whether to allow fracking in New York State and asserted that "publicity savvy activists posing as public health experts are spearheading a disingenuous crusade to prevent the exploitation of the vast quantities of natural gas." Fracking, Whelan wrote, "doesn't pollute water or air." These links to industry have made their efforts to take on notable quacks such as Mehmet Oz backfire spectacularly because they are easily dismissed as so contaminated with ideology themselves. And we should not be surprised, founded in 1978 as a counterpoint to Nader's CSPI, they basically exist to push back against attempts to regulate industry in the consumer's interest. 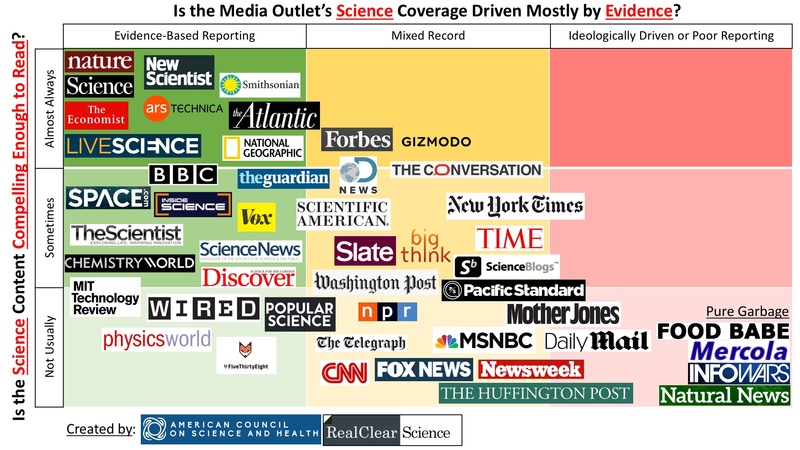 So what we have here is basically an op-ed in chart form, in which media such as NYT, CNN, Motherjones, and historic critics of ACSH are "ideological" or "not compelling" whereas basic science journals like Nature who do not usually wade into their political waters are high impact along with media politically-aligned with ACSH such as Forbes and the Economist. Great stuff. I agree with Nature, it fails at every level. And in the end such an exercise, even if not performed in such a amateurish and obviously fraudulent way, would be enormously difficult to undertake. Almost all news sources screw up, and I have been critical, at some time, of almost every single one of those sources from MotherJones, to Forbes, to the NYT, the Guardian (where I have also published), Wired etc. This is not a straightforward exercise and only saying Nature itself is reliable for news would be incredibly limiting and absurd, as would saying you should believe sources of journalism such as the NYT without question. It also is a conflation of science reporting with periodic garbage in opinion section (Pollan in the NYT for instance is usually in opinion or food sections, huffpo has a separate science entity that is passable), and if we're going to weight media down by opinion sections of course Nature will likely win. They're loath to express an opinion on anything. On to more important matters, what is the deal with the ACSH anyway? It seems a very contradictory organization. They seem to have lots of legitimate scientific content, a staff with legitimate credentials, and a list of distinguished policy advisors, as well as good articles on anti-vax, ag, alti-med etc. The American Council on Science and Health, is not just astroturf, but may be one of the best astroturf investments out there for those interested in advancing their industry message. Why is this? Because they are really good at using legitimate science reporting and advocacy to camouflage a freemarket fundamentalist product. While railing against politicization of science, they happily submit deeply political material as some kind of nonideological exercise in scientific expertise. Take their review of Trumps nominees for cabinet positions with a scientific mission, in an article entitled Evaluating President Trump's Science and Health Choices guess what? There were no bad choices. Given all that, not to mention overruling scientists on Yucca Mountain, the Deepwater Horizon oil spill, Keystone XL, and more, it seems strange that some activists worry the incoming President will be any more anti-science than the last. The reality is presidents embrace science when it agrees with policy. Health and Human Services - The position of HHS Secretary is often given to party loyalists with little or no relevant expertise in healthcare policy, but President Trump instead chose Dr. Tom Price, a medical doctor and Congressman. Dr. Price recognizes that the Affordable Care Act needs to be fixed, a necessary reality in 2017. This office also oversees the Food and Drug Administration and the Centers for Disease Control and Prevention. Given the attention the opioid crisis has gotten, along with concerns in the science and health community that the CDC has been too aggressive in promoting crises to lobby for funding about, there are a number of challenges that Secretary Price faces beyond health insurance. Tom Price, plagued from the start with ethics violations for self dealing through legislation (and - failure to disclose - an ACSH supporter!) is great for HHS. The ACA needs to be fixed (apparently not a political statement), and the CDC is "promoting crises to lobby for funding". For a non-political, non-ideological group this is starting to sound a bit crazy-pants. His critics tried to drum up controversy, noting that Dr. Price has been affiliated with an organization that has been critical of mandatory vaccines and also some essential ones. However, in Senate testimony, he unequivocally rejected them and embraced evidence-based medicine. He actually did not reject the AAPS (they who shall not be named), it was not unequivocal, and that organization is more than antivax, it promotes lies about abortion and breast cancer, the link between HIV and AIDS, and Tom Price is a member. But apparently since he's on the freemarket fundamentalist side, we'll just ignore this, gloss over his weak non-disavowal, and not even mention the name for fear of reminding people just how anti-science this group is. Environmental Protection Agency - On its science findings, the EPA can be terrific, but the accusation by critics has been that they have been picking political goals first, and gathering data later. As mentioned above, the EPA's “Waters of the United States" rule, where private ponds and creeks can be defined as “navigable waters” that fall under the EPA’s jurisdiction, remains mired in the courts, while pollution experts argue that its mandates on emissions were made using narrow data and ignoring studies which showed pollution is not causing any acute deaths in the U.S. now. The EPA needs to return to being a data-gathering agency that recommends policies to elected officials and less of an unassailable oligarchy that skirts around Congress by issuing green decrees. How is this not an intensely political position? The EPA, which has "protection" in its name should no longer be proactive but instead should just gather data? This is a radical reorientation of the function of an agency of government, can you pretend that's anything but a political goal? Oklahoma Attorney General Scott Pruitt successfully challenged EPA rulings on scientific grounds, while acknowledging that the office has an important role to play in regulating pollution, including carbon dioxide. The challenge will be convincing lawmakers and the public that EPA is again evidence-based and making decisions to protect the long-term health of all Americans, rather than, as critics claim, used as a way to pass laws without involving Congress. Tasking someone who has defeated EPA with reforming its work is a bold move, but it won't be easy taming this bureaucratic leviathan or undoing the carefully groomed relationships anti-science groups have created with career bureaucrats there. That's right, antiscience groups are in the EPA now, and the guy who is going to fix it is the Oklahoma AG who sues the EPA so his state can have more earthquakes than any other, and who submits proposals from the oil and gas industry to the EPA as if they are his own. But the ACSH, they hate mixing politics and science. Heavens forbid. Department of Energy - Former Texas Governor Rick Perry has been tapped to head a department that he once said should be eliminated. However, he since admitted he was wrong and had changed his mind – a rare trait in a politician. While many states floundered with the low GDP of the last eight years, Texas did well, and that was because of energy production.The Obama administration too often used this department to subsidize the alternative energy industry. Solyndra, which went bankrupt and cost taxpayers $535 million, is just one example. Tens of billions of dollars were squandered because we subsidized corporations to compete with cheap Chinese labor on solar panels, or promoted wind, which hasn't been a viable large-scale solution in the last 700 years and isn't now. To be successful, Gov. Perry should redirect funds away from corporate subsidies and back to basic research in alternative energy. As a bridge to a pollution-free future, he should encourage the development of America’s natural gas resources which, if done with proper regulatory oversight, will reduce greenhouse gas emissions even farther than it has. Smart natural gas extraction will increase our country’s energy independence and poke Vladimir Putin in the eye, since evidence has shown that the Russians were manipulating environmental activists to prevent America from attaining energy independence and being an energy exporter. Obama's secretary of Energy was Ernest Moniz, a nuclear physicist and an expert in the issues that are DOEs mission. Rick Perry's greatest interaction with the DOE was forgetting its name on a debate stage while trying to list agencies to eliminate. Also I can't resist this, here is his college transcript. Note he, unlike Obama's nominee, is not a nuclear physicist, and he got a D in a class called "meats". But, the ACSH assures us, they hate politics! Rick Perry is going to be great because he will direct us away from renewables (hey the Chinese have those down anyway) and he's probably learned a lot about nuclear physics since nearly failing "meats". There is nothing political to see here. No siree. There you have it, from the ACSH site, Climate change is fake, it's a conspiracy to get grant money (by mostly retired scientists? wah?) and insert politics into science, and the noble scientists of the Oregon petition prove Crichton right. Note Gorski was saying ACSH denies climate change, which as we can see from Singer's article above, is without question at least a historical fact. These days though, ACSH being the savvy astroturf that they are, they don't take the same hard line. Instead they go for the Lomborgian middle - don't deny climate change, just say there is no point doing anything significant to address it, address poverty instead, because hey, we can't chew gum and walk at the same time and only one issue should get funding at a time. All problems will be addressed serially, starting with Malaria. Charming. If someone holds a gun to your head say, "I support a carbon tax", which is safe because it's now probably inevitable (move those goalposts!). This is the classic Galileo Gambit. These are the Galileos (or Wegeners) of our day, misunderstood geniuses or "distinguished thinkers". They should be listened to, not Michael Mann, or Gavin Schmidt. They aren't ideological hacks who have no countervailing theory to explain the data, nothing to offer that survives in the literature. They are just geniuses oppressed by the dogmatic consensus scientists! Just like Galileo! On topics relative to their industries ACSH are of course quite favorable. It's easy for them to be good on antivax, or big ag, their agenda has been consistently documented for almost 40 years to deny any harm from these industries (minus tobacco). But where there is ideological (or likely financial) conflict with the industries they serve and protect we of course see denialism. Their response is to scream "liar" at the top of their lungs but all we're doing is pointing out their words. When challenged, they go into hysterics, the thread on the BS infographic alone is hysterical with Berezow responding to any critique with ad hominem at anyone - reporters, scientists, whoever - calling them liars and lunatics. They certainly comport themselves as cranks when criticized, and despite being challenged by legitimate scientists from Phil Plait, to Oreskes, to Nature itself their little BS infographic stands and I'm sure they remain quite proud of it. But that's pretty typical of cranky denialists, they can't even tell when they're generating crap because they tend to be so incompetent at evaluating science they probably think their little Op-Ed in graph form is super clever. And certainly not political. Never that. It's not I tell you! This hypocritical refrain is my favorite part of all this, I had previously mocked their arguments against a science march and it's part of a general pattern in their writing. They admonish us to keep science out of politics, and politics out of science (an impossibility as I argued), don't march against Trump, it will stain science as political, then they publish op ed pieces saying Trumps picks are great on science and Political correctness prevents advancement of science. They're trying to have it both ways, they don't want politics out of science, just the politics they disagree with, which kind of proves my point. Science is fundamentally political since it's a human endeavor, and humans think ideologically, not scientifically - including these guys. Their other defense is one of distraction. They're not antiscience because - look over there! We're fighting antivax! And altie-meds! This is true. But this is like standing over a dead body with blood on your hands and exclaiming, "But I give to charity!" It doesn't matter that they're very good on other topics. This is part of the slickness of this operation. They generate lots of good content to mix with the bad, package it as "apolitical" and pure science, then pass off their politics and their brand of anti-science with the rest of the good stuff. It's camouflage. It's very clever, and it clearly works. Lots of folks I respect will defend ACSH because they are good on their issues. I would just ask them to take the 30,000 ft view here of what is going on. So, yet another piece of hackery from a very old, very ideological, astroturf organization. One of the oldest, and to their credit, one of the best at the game. I can't wait for them to lose their minds at me, spew childish insults and try to attack me personally (per usual). They can't deny their words though, and they can't defend the ideological garbage they insist is "apolitical". Anyone who has eyes to see understands their record, their own words, and their actions dealing with critics show who they really are. **updated to clarify Cliff Mass is not to be confused with Lindzen or Lomborg as a denialist or lukewarmer. Thank you. I've had my suspicions, but you've nailed it for me. A great service. Science 2.0 bookmark now in trash. Cliff, where exactly did I criticize you? I believe I singled out Lindzen and Lomborg. I would be more offended at Berezow for including you in a sentence with those two, than at me for pointing out they are ideological actors who undermine climate science. This is the trick they pull, mixing the legitimate with the illegitimate to provide this exact cover story when criticized. I'm not going to play this game. As far as name calling, see Berezow calling Gorski a liar above, when he was demonstrably telling the truth. If you are for legitimate debate on climate change you have to identify actors who are dishonest brokers in the debate. To label them as such is not name calling (as Berezow exemplifies), but instead serves to bring debate back into a productive sphere that is not contaminated with nonfactual, ideological, or dishonest positions. "This is the classic Galileo Gambit. These are the Galileos (or Wegeners) of our day, misunderstood geniuses or “distinguished thinkers”. They should be listened to, not Michael Mann, or Gavin Schmidt. They aren’t ideological hacks who have no countervailing theory to explain the data, nothing to offer that survives in the literature. They are just geniuses oppressed by the dogmatic consensus scientists! Just like Galileo! But of course, they’re not like Galileo, they’re denialists." I mention Lomborg and Lindzen going into the quote, I then identify Lomborg and Lindzen as the denialists after the quote. Pretty clear. For the record I'd say it was unfair to be grouped with them, but I wasnt the one who committed that sin. I'm happy to add even more clarification, but I don't think anyone is actually confused. The people who directed you here to my little blog within hours are just grinding their axe. How do you feel about being listed with those two in the first place? I think thats the problem, and that's ACSH gimmick. Mix the real with the fake. I would also point out that failing to quote the very next sentence when I distinguish exactly who I'm talking about - that is unfair. That is cherry-picking in fact. Maybe try less hard to engineer outrage where there is none to be found. Thats your thing right? Cooling people off who read too much into nothing? I would appreciate you adding a sentence that explicitly states that I am NOT one of the denialists you are talking about. OK Cliff, I added a paragraph contextualizing both you and Pielke, it only seems fair he gets an explanation as well. For years I have struggled to categorize him because while he clearly trucks with the denialists including the climate denial clearinghouse at Watts Up With That, he avoids frank denialism or engaging in conspiracy theories. That being said, I think he is ideological and ultimately untrustworthy in his analysis, as do sites such as Skeptical Science that thoroughly track his mixed record on the science characterizing him as "misleading". Will have to agree to disagree there. What I see is a situation in which terms like denialism are critical to help people understand that ideologically motivated players are working in a dishonest fashion to undermine science and the debate over AGW. Just as one wouldn't expect evolutionists and creationists to come together in the long run, some people for ideological reasons are fundamentally-opposed to the science of AGW due to conflict with free market fundamentalism. The assertion that it's a matter of disagreement is just not the case, our point is there is healthy and unhealthy debate, and debate in which some actors are using dishonest arguments for ideological motives is pathological and only serves to delay necessary action. To say it's just a matter of disagreement is to ignore the reality of motivated reasoning, of astroturf groups, and of ideological actors who seek to undermine truthful discussion for personal or political gain. They rely on the good-hearted and well-intentioned to treat them with respect, invite them in, then they set the house on fire. We're trying to point out who the arsonists are.